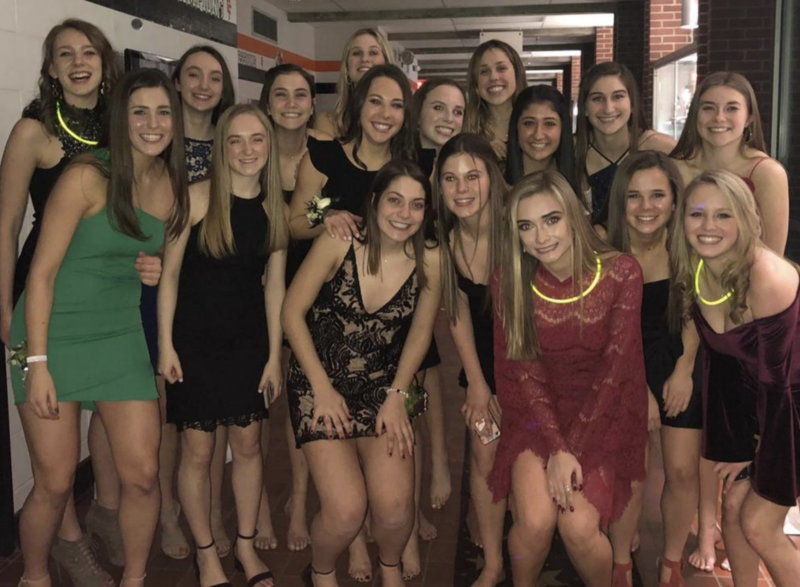 Chagrin Falls Schools Winter Formal was on January 26, the second dance of the year, the first of 2019. The Winter Formal dance is a Sadie Hawkins, meaning girls ask the guys, breaking the norm. Sophomore Nathaniel Conway talked about the dance. “It was super fun, nothing really happened in the beginning but after other people showed up it just kept getting better,” Conway said. Winter formal was organized by the cheerleaders, unlike homecoming, which is organized by student council. Sophomore Ellie Foley also had a few words about Winter Formal. “Definitely a fun night, I really liked the theme, everything was glowing and it looked so pretty,” Foley said. The theme for Winter Formal was glitter gala. The cheerleaders decorated with tons of glitter and lights making it look nothing like a gym. A few parts of the night stuck out particular to Conway. “Watching Quinn LaMonica win Winter Formal king was awesome. I am friends with his sister and he was really deservative of it,” Conway said. After winning Winter Formal king, LaMonica hit the dance floor with senior Shannon Staley. Freshman Ellie Moran was also excited for Lamonica’s win. “I loved seeing Quinn win,” Moran said. Everyone seemed to be excited for Lamonica’s win, as he is a friendly face around the school and friends with most people. Other than Lamonica’s win, certain songs stood out to Foley. “The music was funny. I enjoyed hearing ‘Mo Bamba’ and ‘Sweet Caroline’ the most,” Foley said. Conway agreed with Foley’s choice also adding ‘Bohemian Rhapsody’ and ‘Sicko Mode’ to his top picks. Moran loved the music and the dance itself. “I really enjoyed the dance, it was so much fun, definitely better than homecoming. I felt like because I got to ask, I had a lot more fun,” Moran said. Most students that attended said it was a really good time. Foley encourages everyone to go to the dances. “Even if you didn’t go to one this year, go next year, it’s always so much fun and you don’t want to miss it” Foley said.